Got some questions? See below for some answers. Can I sign up with my Facebook details? Sure. Using your Facebook info to sign up and log on will speed up your registration (and don’t worry - we won’t post anything to Facebook). Yes, by going to the profile page and hitting EDIT PROFILE. We’ll send you an email confirming the change. No problem. Hit FORGOT PASSWORD on the login page, and once you’ve entered the email address attached to your account we’ll send you an email to reset your password. Go to PROFILE, EMAIL PREFERENCES and tell us what info you do and don’t want to receive from us. But remember, if you unsubscribe completely we won’t be able to tell you about free offers and new menu items! How do I correct my birth date? Complete your birth date to receive your free birthday Whopper. But enter your date carefully. You won't be able to change it again. I have more than one voucher on my account. Can I redeem more than one at a time? Sorry, no. One voucher per transaction. What if my barcode won’t scan in the restaurant? Don’t worry – one of our friendly crew will manually enter the bar code at the counter. I want to redeem my Chips voucher as part of a value meal. You can redeem your voucher in the same transaction as your Value Meal but you won’t be able to redeem it as a discounted part of your Value Meal or bundle. Is the Shake & Win game new? Not new, but upgraded. We give you two shakes a day instead of one, 30 mins to redeem (at any participating restaurant) and more prizes to choose from (you’re allowed one prize per day). How long do I have to select my prize? 20 seconds. But remember, if you don’t like the first prize you choose you can just shake again! Once you’ve chosen your prize you have 30 minutes to redeem it at a participating Hungry Jack’s restaurant before it expires. And you can’t use a Shake and Win prize when pre-ordering. I accidentally accepted my first prize – Can I get a second shake? Sorry, no – you’ll have to try again tomorrow (and choose more carefully this time!). Enjoy your meal faster by skippping the queue at front counter or a quick re-order of your favourites. Also enjoy exclusive app rewards! Sign in, select a Hungry Jacks store, fill your cart, complete the check out and then tell us when you’ve arrived at the counter or drive thru. ls there a minimum spend with Pre-ordering? No. Order as much or as little as you like. Can I reorder my last order? Easy. Go to ACCOUNT SETTINGS in App and select PAST ORDERS. Or select RE-ORDER MEALS on the home page. Is it more expensive to pre-order or place my order in store? No. Pre-ordering prices are exactly the same as counter prices. We don’t process your payment until you tell us you have arrived at the store. When do I let you know I am here to collect my food? When you are on your way and close to the store, let us know. This will enable us to ensure you get fresh Hungry Jacks. I just arrived but can’t tell you. Ok, just speak to one of the crew – they’ll make sure you get your order as fast as possible. Why can’t I pre-order at my local Hungry Jack’s? Sorry! We’re in the process of installing lots of new technology in our restaurants. If your local Hungry Jack’s isn’t taking pre-orders yet we promise it soon will be! Can I change my pre-order once it’s made? Sorry, no. But if you missed something off your order you can pre-order it again and pick up both order together. Or you can ask one of our staff to add to the order when you pick it up. Yes, you can cancel the order at any time up until you tell us you’ve arrived at the store. Your payment won’t be taken until you tell us you’re there. Can I send my order in now and pick it up later? Of course. We won’t start cooking your meal until you tell us you’re close to the restaurant. What are ‘location services’ and why do I need to turn them on? 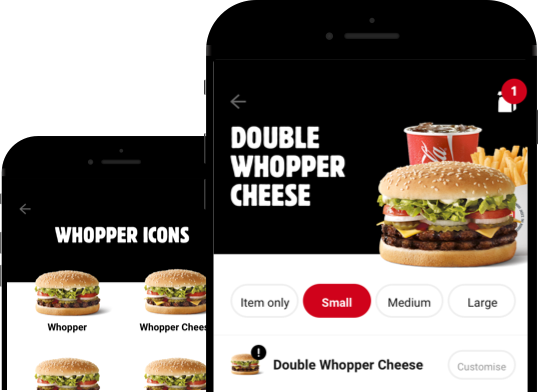 This is just the software which tells us where you are - so that we can tell you where your nearest Hungry Jack’s is, and assist with pre-ordering and Shake & Win! Does the App give kilojoule information? Yes. All our standard food items have a KJ rating. But we can’t provide a rating for your customisation of those food items. Very. When you order with the app we ensure state of the art security software keeps all your data completely secure. The security of data is our highest priority. Why do you charge my Credit Card $0 when I add it to my account? No charge is made at this point. We do this just to let us check the card’s validity and expiry date. I think my card has been charged incorrectly? If you have experienced a problem with payment please let us know at hjonlinesupport@hungryjacks.com.au We’ll need the email address linked to your account, the order number, the date and time it was placed and the amount spent on the order. It will be emailed to you automatically when you’ve completed the order. Can I use Paypal, Apple Pay, Mobile Wallet or similar? We are looking at adding this type of functionality in the near future. What time is breakfast menu served? Most stores serve breakfast from 5 am -11 am, some from 6 am -11 am. You can check out specific opening times on our website or app. Main menu items are available all day. We’re open most public holidays across most stores, including Easter, Anzac day and Christmas Day. But you can check specific opening times of your local store on our website and via the app. How do I apply for a job at Hungry Jack's? All our job applications are online. Visit our 'Work with Us' web page for further details. Where can I find the nutritional information about your food? Click on MENU then select the RANGE and the PRODUCT. Then for more details around allergens and ingredients, click on the ALLERGEN & NUTRITIONAL INFORMATION link. Or if you don’t have access to the internet, you can ask in store. Does Hungry Jack’s offer Halal product? Selected Hungry Jack’s in NSW and Victoria serve a limited Halal certified menu. These stores include Bankstown, Wiley Park, Granville, Bass Hill, Auburn, St Peters, Warwick Farm, Guildford, Greenacre, Hallam & Roxburgh Park. All Halal certified products are listed on the individual restaurant’s Halal certificate which is displayed in-store. Will Hungry Jack’s sponsor my local club? We receive many great ideas from our Customers on how we can get involved in our community. Although we simply can’t be involved in each and everyone we do make sure that we give back where we can. Like our proud partnership with Make-a-Wish which allows us to help make vital wishes come true for really sick Aussie kids. If you would like to apply for either a local, state or national sponsorship please provide details of your proposal in our online feedback form.